Welcome to Day 5 (the final day) of our A Very Toddler Easter series that we are co-hosting with Kristina from Toddler Approved. 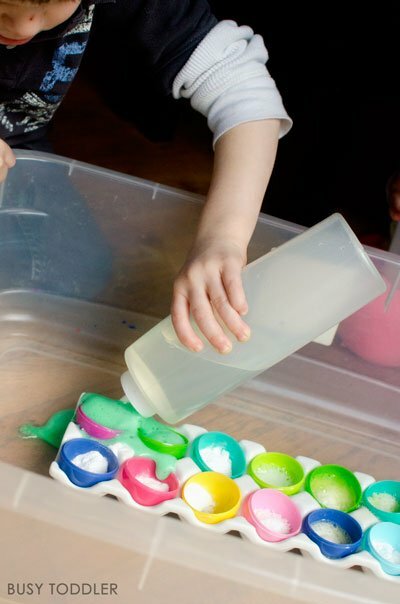 Each day this week, we shared a new Easter activity idea for toddlers. Check out our Easter page for all the Easter activities! 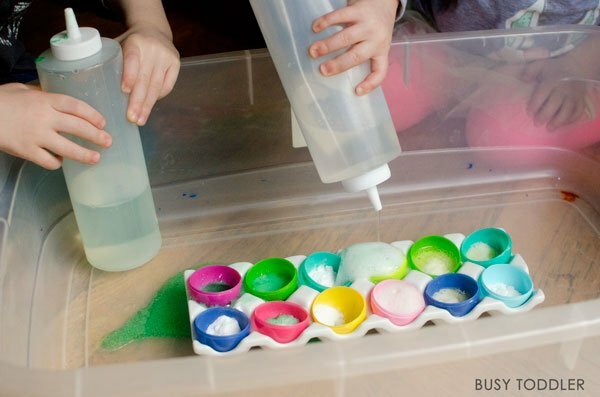 Will the baking soda and vinegar experiment ever get old? It never has at our house and my kids still go nuts for it each time we play. Of course, we had to spice up this experiment for Easter. 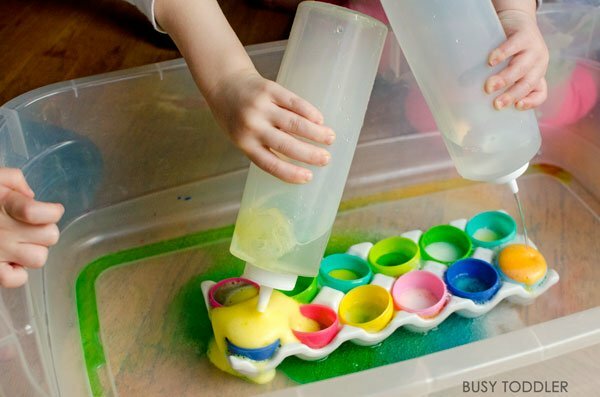 What would an Easter themed toddler week be without an Easter science activity? 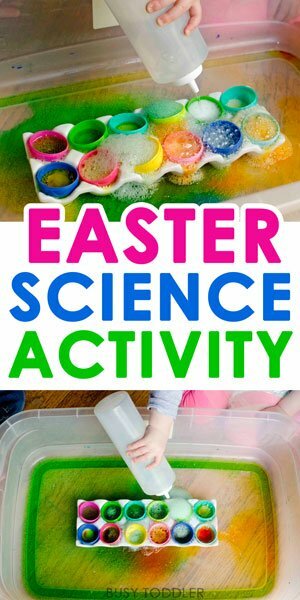 This may look like your run of the mill Easter science activity but I promise you, there’s a hidden secret to this experiment that makes toddlers (and kids of all ages) go nuts. I grabbed my egg carton and set half an egg in each slot. I put a drop or two or three of food coloring. Then a spooned the baking soda on top to hide the food dye underneath. 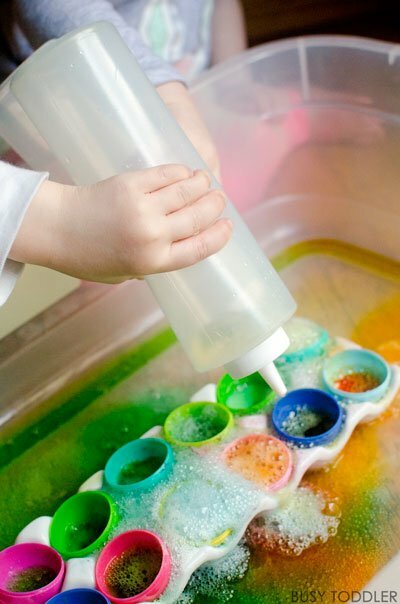 My kids unlocked the colorful surprise with vinegar! I gave each kid a container full of vinegar and told them to “aim well.” They have a blast doing this. Since they don’t know what color bubbles will come out, each time is a ball of excitement and giggles. They can’t get enough of this activity. 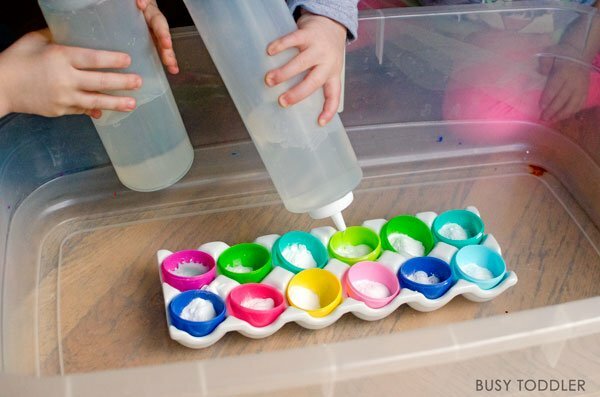 You can keep this activity going by carefully dumping out the vinegar from each egg half. 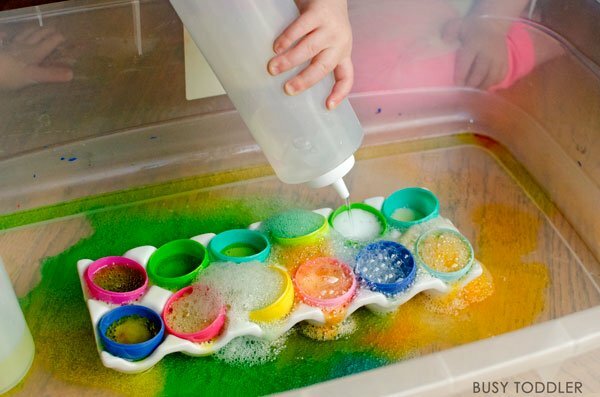 As long as you can see baking soda in the egg, your toddler can keep making colorful bubbles until you run out of vinegar (which is what happened to me after round 4 of this game). I do this in a storage container so we can tip the extra/used vinegar right into that. It works great for us. 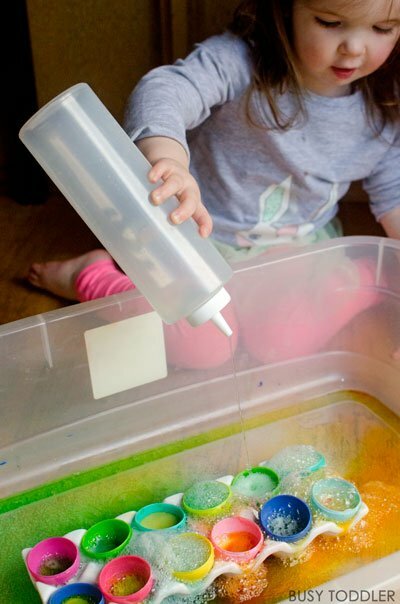 My 27 month old is just getting the hang of those fancy squirt bottles – so help your toddler squeeze or find an item they can easily squeeze if this isn’t right for them. Super worried about the mess? 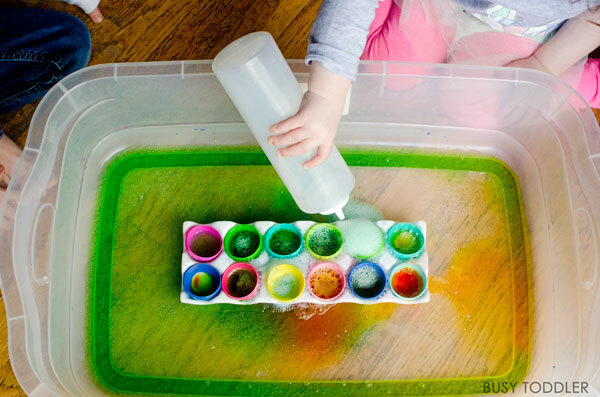 Make this a bathtub activity for some really easy clean up! Once you’re done, just turn on the tub! 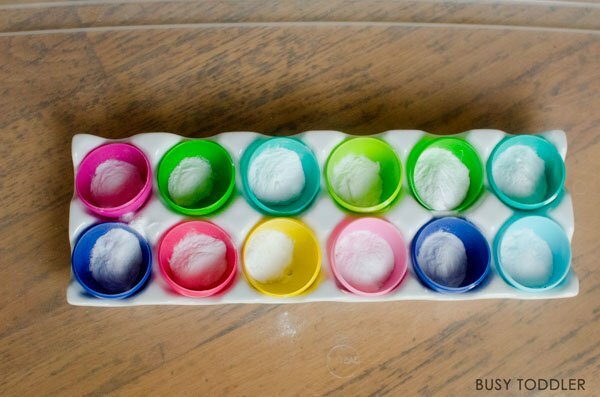 This easy science experiment is always a hit for my kids, no matter how many times they play it. This is their jam, their favorite activity. I’m so glad we could put an Easter spin on it to end out our “A Very Toddler Easter” series. 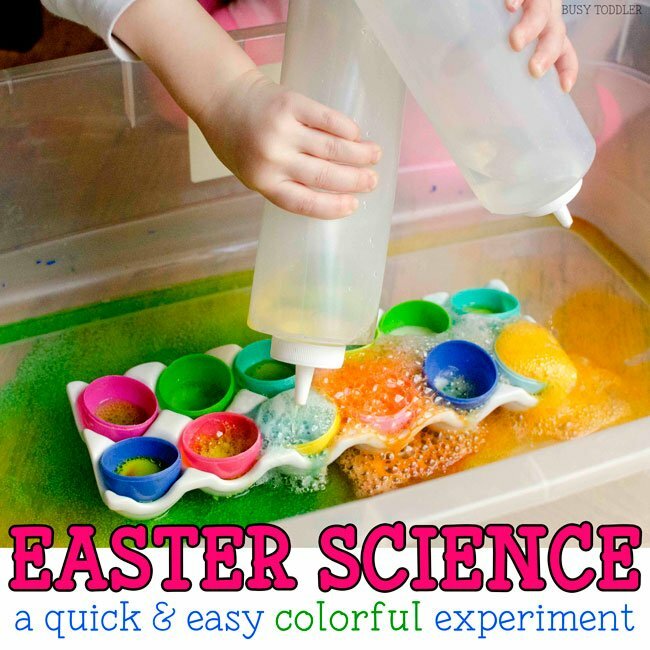 What will your kids think of this Easter science activity?